But in the process of getting the photo's of placenta encapsulation from my fabulous readers I also got some really amazing pictures of placentas that were not being encapsulated. One mom sent me a picture of her battledore placenta (where the cord is inserted near the side rather than right in the middle) and a twin mom sent me the picture of her great big twin placenta. A battledore placenta is one in which the cord has inserted on the side or border rather than in the middle. It doesn't alter the function of the placenta but is rare. How cool is that picture! Same battledore placenta but from another angle. This smooth side of the placenta is what faced the baby. The other side of the placenta is what looks bumpy and is what is attached to the uterus. Great picture of a placenta with the cord still attached. Notice how this one has a typical insertion. This mom was getting ready to have her placenta encapsulated. 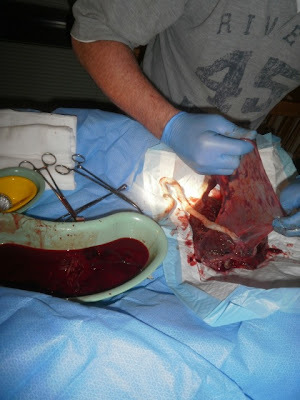 The following two pictures are of a placenta from a mother of twins! She said, "Here are two pictures of my placenta(s) from my twin fraternal birth. One of the placenta and one of my doula showing it to me. I was in shock at how HUGE it was!" Yes, your body will create a placenta for the baby(s) you are growing! A GREAT BIG TWIN PLACENTA. And look at that twin nursing mama! The next two pictures are of the placenta being birthed. This is also known as the third stage of labor. There is some blood involved at this point, of course. When the placenta detaches from the uterus where it has been attached there is a "wound" you could say where it has been attached for all this time and blood comes out as part of the birth process. Notice that the cord is still attached to the baby even though the placenta is already delivered! I love this. We often cut the cord almost immediately which not only can deprive the baby from some of it's own intended blood supply, but it also makes it all to easy to take a baby away from it's mother. Nature intends for us to be able to hold our babies and ONLY US for the first few minutes- if possible. The placenta will be examined after it is delivered to be sure that it is totally intact. Notice the bag or membranes as they are attached to the placenta. Inside lived the baby, surrounded by a cushion of amniotic fluid. We are wonderfully made. The next two pictures are from another placenta and show both sides of it. These are fabulous educational shots. Obviously one side of the placenta faces the baby (where the cord is attached and where it is smoother) and the other side is implanted in the uterus. The side that was implanted in the uterus. 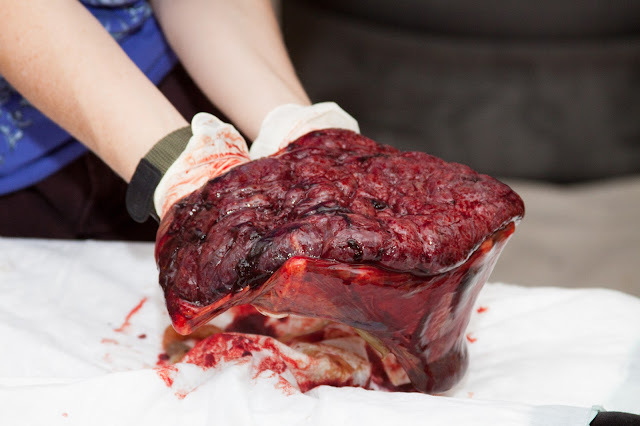 Flipped, showing the membranes or "bag" that housed the baby and which is also attached to the placenta. The next few pictures show another placenta from a few different angles. The umbilical cord with baby still attached before the placenta has delivered. Picture of the amniotic sac still attached to the placenta. The "baby" side of the placenta with vessels visible. Hope you enjoyed this post dedicated to the placenta and some of it's variations. It is a fascinating organ. I wish I had a picture of my last placenta! Velementous insertion, cord coming from the side with multiple accessory lobes! I think all of labor and delivery was hovered around it in awe. I had a battledore placenta with my third baby. 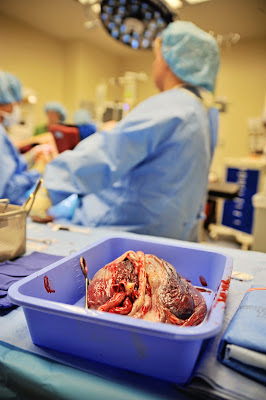 The cord detached from the placenta when the baby was delivered. The Dr. clamped the end and pushed all the blood back into the babys body, saved us alot of trouble in the future. Amazing- Where they worried about the velementous insertion Cori? Crazy.